The whole fear for greenhouse global warming is based on actual temperature measurements all over the world, because these would confirm whether computer model projections are right. Not just today's record is important, but also that of historic times, to show that temperatures began to rise critically with the combustion of fossil fuels. Many methods for measuring temperature both now and in the distant past, are available and these are discussed in this chapter. It is also shown how major fraud has occurred. Classical thermometers, their properties and limitations. A stand-alone climate station, shielded against the worst influences, standardised and used all over the world. The thermometers inside the Stevenson Screen measure the temperature of the air above the ground, but does this represent the surface temperature? People change their environments and shield themselves from harsh weather. They also burn fossil fuels. As a result, thermometers in their neighbourhoods show false warming. Weather balloons have been in use for a long time, providing a reliable track record of the entire troposphere. Most heat on Earth is stored in the oceans, so measuring the oceans' temperatures is very important. First done by ships, later by ever more intelligent buoys. Thermometers are found where people live, so they are prone to urban heat. The areas where no people live are so large that the 'average world temperature' cannot credibly be reconstructed. Past temperatures can be inferred from proxies like boreholes, tree rings, calcite skeletons and sediments. How do they differ and what are their shortcomings? The summer-winter temperature signal is very large compared to its average trend, while also minima and maxima show different trends. The southern hemisphere has even been cooling in the past 40 years while the northern hemisphere warmed. Since the climategate leak of e-mails, the instrumental temperature data has been found severely corrupted in many ways, with the obvious purpose to 'prove' global warming. Begin your study of planet and sea at the Seafriends home page or our sitemap. Go to climate index. Measuring temperature should be a most simple scientific exercise, which a primary school student could do to full satisfaction. It is therefore a surprise that it becomes a major problem to do right, in such a way that temperatures all over the world can be compared, and stored in a database. Today there are still two temperature scales in use: Fahrenheit (UK previously and USA still today) and Celsius (the rest of the world). The Fahrenheit scale has been replaced scientifically by the Celsius scale (called Centigrade in the UK and USA), and later by the Kelvin scale, which has identical one degree steps. Celsius: runs from zero at pure water's melting point to 100º at water's boiling point. To convert from F to C: C = (F - 32) x 5/9. In this chapter we'll have a close look at available thermometers and how they differ. To exclude rain and unwanted radiation, thermometers are placed in a standard Stevenson Screen, found all over the world. But the Urban Heat Island effect still has its warming influence. Temperatures are also measured by weather balloons, and ultimately by satellite, each posing its own problems. Ocean temperatures were previously measured by ships, but now thousands of sophisticated diving buoys do the work with high precision. With all these measurements in place, one would be able to measure average world temperature, but even this is a failing effort. Temperatures in the past can be measured from isotopes and from various proxies, each having its own set of problems. Finally we'll analyse where the world's warmth or coolth is stored, and whether temperature measurements can be used reliably to measure the amount of cooling or warming of the planet. Temperature is an important quality in daily life, science and industry. Just about all processes depend on temperature because heat makes molecules move or vibrate faster, resulting in faster chemical reactions. Heat is wanted and wasted, and so is cold. When substances are cold, the processes within proceed more slowly, as in chilled or frozen foods. It does not surprise therefore that many ways have been invented to measure and control temperature. When a substance (solid or liquid or gaseous) is heated, it extends or expands (with few exceptions). When such an extension can be seen, a thermometer can be made. Substances with high expansion coefficients are of course most suitable but there are other requirements. The Six's maximum and minimum thermometer is a clever use of an alcohol bulb thermometer with some mercury in its capillary, topped up with more alcohol and ending in an empty bulb with some vacuum. Because mercury is so dense, a magnetic metal needle will float on it, and can be pushed against some friction (a magnetic back plate). At maximum temperature the furthest needle will stay behind, attracted by the metal backing plate. Likewise at minimum temperature, the closest needle will stay behind. After reading the thermometer, the two needles can be re-set (drawn onto the mercury level) with an external magnet, or by pushing the metal back plane away from the magnetic needles, which then descend by the pull of gravity. The Six's thermometer has the advantages and disadvantages of both mercury and alcohol thermometers. But its capillary must be wide enough to place the metal floating pins, which means that it cannot be read very accurately (0.5ºC is difficult). Please note that bulb thermometers are sensitive to outside pressure and are thus less suitable for deep sea temperature measurements, unless they are encased inside a rugged mantle. The industrial bulb thermometer consists of a relatively large copper bulb with long capillary tube that can be bent and guided through the innards of an appliance. At its end it has a tiny pressure sensor (manometer) which operates an electrical switch. With a screw its setting can be altered. These thermo-controllers are extensively used in air conditioners, washing machines and other appliances. A metal spring thermometer can be made by coiling a metal strip with an indicator attached to its loose end. When the strip expands, the coil unwinds somewhat, which moves the indicator. This kind of thermometer is useful where a wide range of temperatures needs to be measured with low accuracy, as in cooking food and for ovens. The bi-metal thermometer is based on the difference in extension between two metal strips, sandwiched together and riveted or spot-welded at both ends. This causes the strip to bend when temperature changes. The strip can be bent, folded or coiled to amplify its effect. Bi-metal thermometers are extensively used in temperature controllers to switch electrical devices like warmers and coolers on or off. They are less suitable for absolute temperature measurement. Some bi-metal thermometers are dimpled to give a click-clack effect, a positive transition at a certain temperature (click), but with hysteresis (lagging behind) when clacking back. Temperature also makes electrons move faster inside conductors like metal, thereby changing their resistance. The platinum resistance thermometer is based on its resistance changing precisely with temperature. The change in resistance can be measured with an electronic circuit and amplified as an electrical signal and shown on a voltage indicator. To minimise external influences like supply voltage variations, a 'bridge' circuit is used which essentially measures the difference in voltage between the platinum resistance and another known resistance. Because platinum is a noble metal, the thermometer is very stable while able to operate under a very wide range of temperatures. For ultimate precision, linearising circuits are applied, and the 'known' resistor may be kept at a known temperature. The thermocouple thermometer is based on the difference in conductivity (electron mobility) between two metals, brought into contact with one another or spot-welded together. When two dissimilar conductors are brought together, a voltage difference occurs, which can be measured. When warmed, the voltage increases due to a higher electron mobility. Thermocouple thermometers can measure a large range of temperatures and are very stable. They are also independent of the contact area, and are thus easy to make. They are also insensitive to outside pressures. However, thermocouples occur in pairs and one of them must be kept at a constant known temperature. When thermocouples are stacked in series, their sensitivity increases proportionally, known as a thermopile. They can be used for measuring heat flow. The thermistor thermometer is based on the conductivity of a semiconductor, which is quite sensitive to temperature. So it acts like a resistance thermometer. Unfortunately the resistance change is not linear and can be corrected only to some degree. It also has a very limited range. Thermistor thermometers are suitable for measuring the temperature of living organisms, like humans. They can be made rather small (less than 1mm). Infra-red thermometers measure the infra-red (IR) radiation of substances. Therefore they do not need to be in direct contact with them. But the measured object must be warmer than the infra-red detector. So they are more suitable for measuring high temperatures at a safe distance. By cooling the IR detector to a known temperature, also lower temperatures like that of living organisms, can be measured. Note that the CO2 in air absorbs IR radiation, which limits their use but manufacturers excluded the CO2 absorption band. The accuracy of IR thermometers is limited. Passive infra-red (PIR) detectors also detect warmer-than-air objects, but they are used for detecting movement of such objects, and not their precise temperature. The Stevenson screen was designed by Thomas Stevenson (1818-1887), a British civil engineer, in order to more accurately measure air temperatures rather than side effects like solar irradiation heating up the thermometers. To reflect heat back, it is painted white, but better still would have been reflective aluminium. It has louvered sides to let the air through but not the sunlight. Once it became an accepted standard, the Stevenson Screen is now spread all over the world. It now allows temperatures to be compared wherever they are measured. A lot of thought and experience went into its design: the door swings down rather than to one side so that the wind won't catch it on windy days and rip it off the hinges, and it opens facing north, to keep the sun from shining directly on the thermometers while reading the thermometers. Inside it one finds two normal thermometers (alcohol for cold areas, mercury for warm places), but one of these has its bulb wetted by a wick soaked in a bottle of water. This wet bulb thermometer gives an indication of evaporation, because evaporation of water causes cooling. There is usually also a max-min thermometer. The thermometers are placed such that they can be read with ease and replaced with minimum effort. An important consideration is also that the louvered box stands a fixed distance above the ground, for least interference with low objects that may impede wind flow (and snow). readings are done by humans. It involves going out in the rain, snow and sleet to the remotely placed weather station. There the finely scaled thermometers must be read to within 0.1 degrees, with fogging spectacles and suchlike. The data must be written up with a pen that won't work on soggy paper, etc. So shortcuts are taken. Let's skip today because it is much like yesterday and we'll use those figures instead. Who will do it during the summer holidays? The broken thermometer has still not been replaced. it is difficult to read a thermometer over the meniscus (curving surface of the liquid inside) square-on (without parallax error). there can also be a bias caused by the time that the reading is done. Air warms up during the day and is warmest a couple of hours after mid-day. During the night it cools and is coolest just before dawn. So in the morning one reads the maximum of previous day and the minimum of today. Are these two noted down for the same date? In the afternoon the reading shows today's maximum and today's minimum. thermometers have hysteresis (a kind of friction), which means that once they go up, it takes a little longer before they go down again. the glass of thermometers is a liquid which hardens (drifts) over time, producing an error of about 0.07ºC per year. the liquid inside may evaporate, and condense in the top of the tube, thereby producing a lower reading. electronic thermometers must be calibrated regularly (and a log kept), because they also drift over time. when thermometers are replaced, often a jump in temperature is recorded. sometimes moisture or snow are blown onto the thermometers, which affects their readings. temperature decreases with height at the standard lapse rate of 0.6ºC per 100m altitude, but this is not always true. stations located near the sea measure sea temperature during sea winds and land temperature during land winds, with usually a large difference between them. What do we want to measure? Air temperature over land or sea temperature? There are years with more land than sea winds and years the other way. the weather changes from hour to hour and place to place. What is the right reading? The upshot of all this is that a large number of sites and observations is needed to even out reading errors, but one can never truly correct for UHI, altitude and distance to the sea. "The ±0.46ºC lower limit of uncertainty shows that between 1880 and 2000, the trend in averaged global surface air temperature anomalies is statistically indistinguishable from 0 C at the 1-sigma level [half the width of the grey envelope]". One cannot, therefore, avoid the conclusion that it is presently impossible to quantify the warming trend in global climate since 1880." What do we measure with Stevenson Screen meteorological thermometers? The problems with temperature measurements do not end with the ones described above, because the real question is what do they measure? It is claimed that they measure Earth's surface temperature, but is that really so? What do the maximum and minimum temperatures tell us? Is the day's average equal to the middle between maximum and minimum? The graphs show some of the problem. A day begins with the blue curve of net sunlight beginning just before six in the morning and ending just after six in the evening (apparently in spring). It doesn't take long before the air begins to warm too (sensible heat, orange) due to the warming of the surface, and later still some evaporation happens (latent heat, cyan). But watch what infrared out-radiation does (net IR, magenta), shown upside down because it goes out rather than in. It increases somewhat during the day and is still present at night, in total area equalling that of sensible heat (conduction and convection). In other words, the idea of infra-red out-radiation from the surface is only half supported by measurements. The part that does, is soon absorbed by air molecules and converted into sensible heat. Source . This graph shows measured temperatures during a single year. 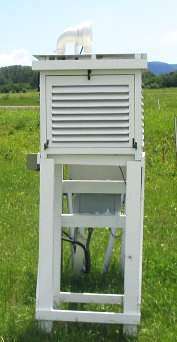 MSAT means Meteorological Surface Air Temperature, the temperature inside the Stevenson Screen. It has two outomes, Min MSAT, the minimum temperature (black) and Max MSAT, the maximum (magenta). The average between these is considered the surface temperature for the global temperature datasets. But as you can see, it does not represent the actual surface temperature, 1.5m lower, shown in blue (Max) and yellow (Min). The average between these two is considerably larger. Also note that the Min MSAT follows the minimum surface temperature and that Max MSAT comes close to the real average..
 Roy Clark (2010): It Is Impossible For A 100 ppm Increase In Atmospheric CO2 Concentration To Cause Global Warming.http://venturaphotonics.com/GlobalWarming.html. It is human nature to change his environment for maximum comfort, which means shutting out the nasty aspects of weather like rain, cold wind and intolerable heat. So where people live, one finds wind breaks, shading trees, houses, roofs, concrete, parkings, roads, air conditioners, cars, air planes, all contributing to a change in air temperature. And they all cause extra heat. Where Stevenson screens once stood isolated in a meadow, over time they find themselves surrounded by civilisation, causing the air temperature to rise. This is called the Urban Heat Island effect, which can corrupt temperature data substantially. 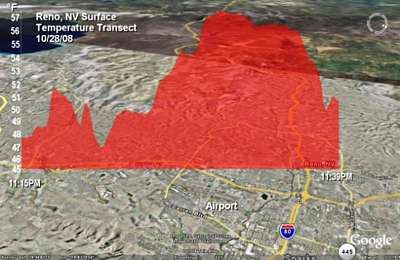 This image (courtesy Anthony Watts) shows the urban heat island effect over Reno California USA before midday. The temperature measured varies from 47-57ºF (by 5ºC). so the question is what is THE temperature of Reno? Is it the average (51) or the minimum (47)? Clearly, the UHI causes a formidable difference between cities and rural places and more so with bigger cities. Its main problem lies in its unpredictability from place to place and over time. Tokyo with its 18 million inhabitants and massive urbanisation and transport systems, has a very significant UHI signature, as shown in this graph (from Anthony Watts). It has increased by a massive 3ºC in the past century and is still increasing further. By comparison nearby Hachijo island which has also suffered some urbanisation, shows a modest temperature increase of less than 0.5ºC in a century. 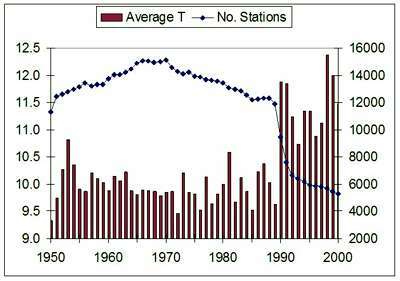 Which of the two stations would you exclude from a world temperature database? Guess what the people of Tokyo are more interested in? Note also that temperature swings (a decadal cycle) are larger at Hachijo, perhaps caused by swings in sea temperature. The graph shown here was derived from 47 counties in California, averaging their temperature trends for the period 1940-1996 and plotting them against their population size. Rural stations on left and urban stations on right. From the data points a straight line can be drawn which would cross the zero temperature trend. 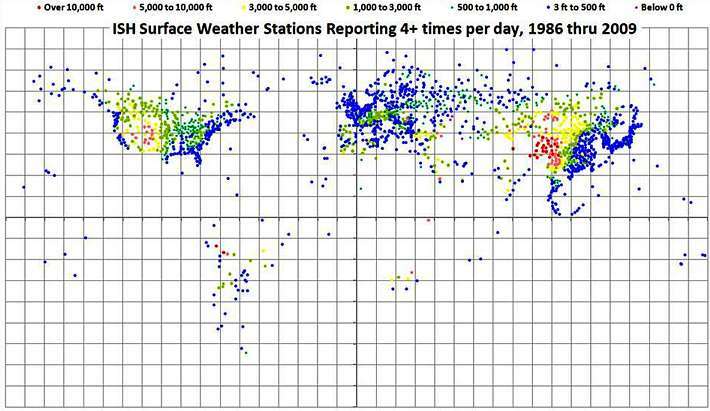 Also shown on this graph are the six stations "X" used by NASA GISS from which global averages are calculated. As can be seen, five out of six are located where a significant Urban Heat Island (UHI) effect is experienced, of about 0.6 degrees. Not shown is the historical growth of these counties over the 56 years, but it is evident that much of 'global warming' consists of the UHI. Many similar studies exist, all consistently showing that UHI seriously pollutes the instrumental record. In 1996 Goodridge grouped Californian counties by population size and obtained these three temperature curves for the 20th century, using standard temperature datasets. Once more it showed that population density (UHI) is the main contributor to 'warming'. On a daily basis, 1600 weather balloons are released from 800 stations, usually at the same time: 0:00 UTC and 12:00 UTC. The 2m diameter rubber latex balloon is filled with hydrogen gas. Its mission is to measure temperature, relative humidity and pressure, which are used for weather forecasting and observation. Modern weather balloons can now also measure position and wind speed by using GPS positioning. The data is transmitted by a rugged box of electronics, at a frequency of ~1680MHz or ~404MHz (300mW) at intervals of 2-5 seconds. During its short flight of several hours, it may rise to above the troposphere and travel for over 300km. Its mission is to transmit data up to an altitude of 7 km (0.4 bar) above which the balloon will burst. The electronics package then parachutes back to the ground. The advantage of weather balloons is that they truly measure the air's temperature, unaffected by Urban Heat Island effects. Satellite temperature measurement also have this advantage, but cannot measure over a range of altitudes. This graph compares the three methods over a period of 20 years. Note how balloons and satellites agree, and how the surface temperatures show an urban heat island effect of some +2 degrees. Not shown is how regular adjustments aim to bring these measurements into agreement. For instance, the starting point in this graph has been aligned this way, and perhaps 1998 as well. Ocean surface temperatures have been measured by ships for several centuries. First it was done by collecting surface water in a bucket while steaming on, but later the engine's cooling water inlet was used. Unfortunately this made a difference, because the water inlet is at some depth under water. Today this may serve to advantage because satellite can measure only the top few centimetres of the sea because infrared radiation is rapidly absorbed by water. Because water continually evaporates from the sea, the surface film is somewhat colder than a few metres down. This map from Reynolds (2000) shows where the ships' tracks are, and that their measurements are in no way representative of the entire oceans. 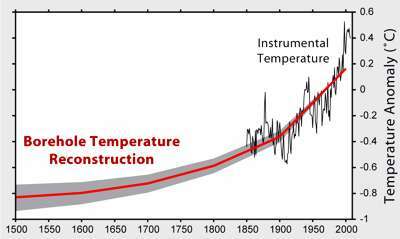 The graph shows both land and ocean temperatures from thermometers, since 1880. As can be seen, the land temperature rises more steeply than the sea temperature, most likely caused by the Urban Heat Island effect. Even so, both follow similar oscillations; a steep short decline followed by a long slow incline. The sea warms by about 0.5 degrees per century whereas the land warms by about 1.2 degrees per century. Compare this with the UHI effect of Tokyo above. What is omitted from this graph is the steep decline before 1880. Since the year 2000, and benefiting from technological advancement, an aggressive programme was begun to measure the oceans entirely, with tide gauge stations, moored buoys, drifters and ships of opportunity. The ARGOS satellite system circles Earth to collect the data, while the AOML has responsibility for the logistics of drifter deployment and quality control of the resulting data . The map shows the locations of ARGOS drifters from the USA (blue) and UK (red/orange). Of course their positions change daily. A main advantage of the ocean drifters is that they collect data of the air as well as the sea at various depths, and entirely without human error. A drifting buoy is an inexpensive, autonomous device which is deployed by ships of opportunity. Distributed throughout the oceans of the world, it is designed to drift freely with the ocean surface currents, has an average lifetime of more than a year, and can measure sea surface temperature, surface currents, and sea level pressure. The buoy is a round sphere of about 0.5m diameter, from which an array of cables and sensors hangs. It measures temperature, salinity and ocean currents. The collected data are then transmitted back to shore via satellite. 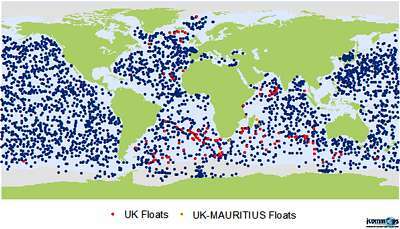 In July 1995, data were logged from more than 750 buoys. An expendable bathythermograph (XBT) is another inexpensive device which is also deployed by ships of opportunity. An XBT is a small instrument that is dropped into the ocean from a ship. During its descent at a constant rate, an XBT measures the temperature of the seawater through which it descends, and sends these measurements back to the ship through two fine wires that connect the ship to the instrument. XBTs generally have a depth limit of 750 meters, but some reach depths of 1800 meters. Many ships relay summaries of the vertical profiles of temperature back to the shore by satellite. 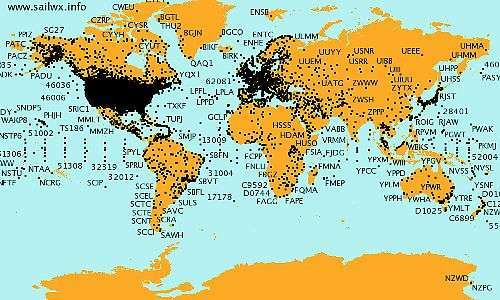 Meteorological centers throughout the world receive data from both the XBTs and the buoys via a global communications network, and use it to prepare the analyses that are essential for forecasts of weather and climate. The complete vertical temperature profiles are sent to data collection centers after the ships reach port. The Upper Ocean Thermal Center at AOML has responsibility for quality control of an average of 2,000 XBTs per month. The latest drifters are semi-autonomous, being capable of making deep dives to 200m, drifting there for 9 days, and surfacing at intervals to transmit their data and recharge their batteries. Over 3000 of these autonomous drifters have been released so far. As their technology becomes more sophisticated, they could perhaps at some time also measure clarity, light extinction with depth, pH, pCO2, plankton concentrations, oxygen and carbon fluxes, etc. Since satellites began to be used for measuring environmental variables (GOES), both land and sea temperatures have been measured with good accuracy. The map here shows average ocean temperatures for a given year. It is important to remember that this represents only the very thin surface of the oceans. 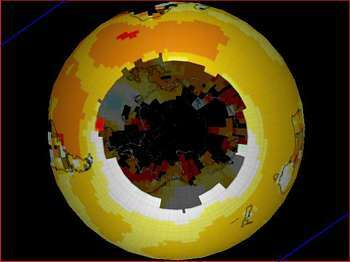 The advantage of satellite measurements is that they truly cover the whole of the world. Their disadvantage is that they cannot measure absolute temperatures, and that they vary slowly with time (drifting). atmospheric heat does not go down into the ocean. the ocean's surface heat comes from solar irradiation. 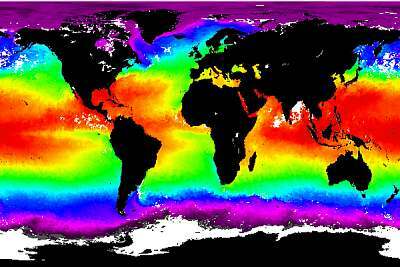 ocean drifters will soon give an almost complete picture of ocean temperatures and where warmth is stored. satellites measure only the top few centimetres of the ocean, which is more related to irradiation and evaporation. the ocean is still warming after the end of the recent ice age. 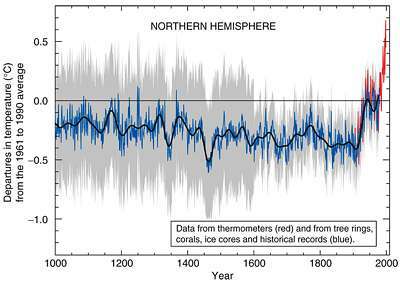 the land temperature record has been 'adjusted'; that of the sea temperature not. http://www.aoml.noaa.gov/general/ Atlantic Oceanographic & Meteorological Office AOML. http://www.aoml.noaa.gov/phod/dac/2006_gdp_report.pdf An impressive report on the ocean drifter programme (PDF) slideshow. The places where thermometers are placed were never selected with a view of collecting a representative set of temperatures from which the world's average could be calculated. They are simply located where people live, and that introduces the urban heat island effect. The two maps below, show that the world is not adequately or evenly covered. To make matters worse, many temperature stations are pretty recent and do not have a long-term record. Others do not satisfy stringent quality requirements. This map shows where today's reliable weather stations are located and at which altitudes (colour-coded). The above two images show the sizes of the areas around the south pole (left) and north pole (right), of unknown temperatures. Also large unknown areas in the centres of continents, exist, just visible on the sides of the two hemispheres. Global temperature databases attempt to fill these areas in with the temperatures surrounding them, which invites fraud. The fact remains that global temperature cannot be guessed at from the available thermometers. From the above maps one can see that it is impossible to arrive at an average temperature for every square on the grid. Besides, the squares become smaller towards the poles (but this can be accounted for). Yet this is precisely what NASA (USA), and the Climate Research Unit (UK) have done, with disastrous results. These results were then used in the IPCC reports as if they were reliable. To make matters worse, these scientists have been 'adjusting' the original data to fit their expectations. It is important to remember that 'world average' temperatures mean less than a good time series of a single remote station. It also implies that the evidence from thermometers to support 'global warming', is entirely unreliable. There is also a thermodynamic 'finer point': if one wishes to know the effective out-radiation, which is proportional to the fourth power of absolute temperature (T x T x T x T), then this should be taken into account, making the effective temperature noticeably larger than the average temperature. Finally, were average temperatures to have any meaning, it should also be related to the heat content where it was measured. Ice caps and oceans have large latent heat, whereas deserts have low latent heat. Thus in climatology, one should be very cautious about 'temperature averages'. most thermometers are at sea level, by the sea, which is a sharp habitat boundary. Depending on wind direction, they measure either land or sea temperatures. thermometers are found where people live (also by the sea), hence the large influence of the UHI. the southern hemisphere is severely misrepresented. large land masses are misrepresented. large gaps exist with no data. 'average world temperature' cannot be calculated by filling in the blanks. For various known and unknown reasons, the chemical elements found on Earth have 'sister' elements or isotopes (Gk: isos=equal; topos= place; as in the same place in the periodic table of elements). Isotopes behave chemically alike but have different bulk (different number of neutrons). Some isotopes are unstable and fall apart by radioactive decay (alpha, beta or gamma radiation). One of the best known isotopes is radioactive carbon-14 which is created in the atmosphere from the element nitrogen. Because of its beta-decay (emitting an electron) and half-life of about 5000 years, it is extensively used in radio-carbon dating of biological substances (wood, shell, hair, etc.). Carbon-14 measures time rather than temperature. Carbon-14 occurs in minuscule amounts, e.g. making up as much as 1 part per trillion (0.0000000001%, 1E-12) of the carbon in the atmosphere (CO2). The half-life of carbon-14 is 5,730±40 years. It decays into nitrogen-14 through beta decay (emitting electrons). The activity of the modern radiocarbon standard is about 14 disintegrations per minute (dpm) per gram carbon. Fortunately, plants concentrate CO2 more than thousand-fold so that enough carbon-14 is accumulated for testing. But measuring carbon-14 in air with some precision, remains impractical. Beryllium is the fourth element in the Periodic Table, after Lithium and before Boron. It has an atomic mass of 9, made up by 4 protons and 5 neutrons. It can be made as a fragment from heavier elements (nitrogen 14, oxygen 16) by cosmic bombardment (spallation) which expels protons and neutrons. Also cosmic radiation itself contains beryllium. Radioactive Beryllium-10 has a half-life of 1.51 million years, and decays by beta decay to stable Boron-10 with a maximum energy of 556.2 keV. 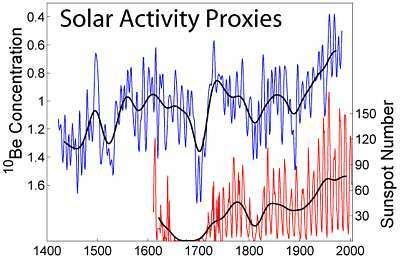 This figure shows two different proxies of solar activity during the last several hundred years. In red is shown the Group Sunspot Number (Rg) as reconstructed from historical observations by Hoyt and Schatten (1998a, 1998b). In blue is shown the beryllium-10 concentration (10E4 atoms/(gram of ice)) as measured in an annually layered ice core from Dye-3, Greenland (Beer et al. 1994). Beryllium-10 is a cosmogenic isotope created in the atmosphere by galactic cosmic rays. Because the flux of such cosmic rays is affected by the intensity of the interplanetary magnetic field carried by the solar wind, the rate at which Beryllium-10 is created reflects changes in solar activity. A more active sun results in lower beryllium concentrations (note inverted scale on the blue plot). Note that the sun's variability is much more than suggested by the satellite record (the solar constant). Oxygen-18 or 18O has two extra neutrons instead of the usual 8 (10n+8p). It is a mysterious element that occurs in concentrations of around 0.2% and is stable (not radioactive). Practical measurements have shown that it correlates with temperature: higher concentrations mean lower temperatures, but the why and how eludes somewhat. The graph shows 18-O variations in foraminifers which are usually found on sea bottoms in the shallow coastal zone. It is known that the heavier 18-O is more reluctant to evaporate (it has a lower vapour pressure). Thus the vapour from the sea (which is rather constant in 18-O), has less 18-O than the sea itself. As the vapour condenses into rain, 18-O does so more eagerly because of its lower vapour pressure. Thus plants feed themselves with water that is higher in 18-O. Ice is therefore also higher in 18-O. But then it becomes shaky, as this concentration differs with latitude: 0.67 ‰/ºC Greenland, 0.76 ‰/ºC Antarctica, and 0.33‰/ºC in ice cores. So remember that it cannot be compared from place to place and it cannot measure absolute temperature. 18-O can measure only relative temperature changes in one place. But it gets worse. Present thinking is that colder temperatures cause ice caps to expand, which are deficient in O-18, leaving the sea more abundant in 18-O. Thus the delta-18-O measures the amount of ice in ice caps rather than actual surface temperature. As a consequence, the 18-O signature lags many hundreds of years behind surface temperature. When Earth is cooling, water is transported through air to the ice caps, so the time lag is maximal as also the rate of the 18-O signature is more gradual than that of surface temperature. When Earth is warming, ice caps melt and meltwater flows almost instantaneously back to the sea. So the warming part of the 18-O signature lags less and changes more steeply. Scientists use the symbol delta for the Greek letter 'd', for differences in quantities. where the standard value is either a standard sample (as in PeeBee Belemnite for 13-C) or any other sample. oxygen-18 is a stable isotope in its behaviour over time and its quantity on Earth. temperature measurements with it join up to today's temperature, giving high credibility. the delta values are qualitative and must be calibrated against known temperatures in the past for each site. temperature measurements with 18-O are highly consistent but interpreting them is not. higher delta-18-O values mean colder; lower values mean warmer. the cooling slope in the 18-O signature lags considerably and is always gradual. the warming slope in the 18-O signal lags less and is steeper than the cooling slope. Carbon-13 is a natural stable isotope of carbon and has one extra neutron (7n + 6p). It makes up about 1.1% of all natural carbon on Earth. Whereas isotopes are normally detected by mass spectroscopy, carbon-13 can sensitively be detected with Nuclear-Magnetic Resonance (NMR). It is also a mysterious isotope that is preferentially avoided by plants. Thus wherever 13-C is used, there is less of it. C-13 is always measured against a world standard called PeeBee Belemnite or similar. Belemnite is a calcium-rich deposit from the soft internal shells of ancient belemnite inkfish, with a delta-13-C agreed to be the zero base. The diagram shows typical concentrations (almost always negative), and where they occur. Note that the modern 'grasses' (maize, sorghum, sugarcane) have a four-step photosynthetic process (C4) which is more efficient than the much more common three-step (C3) process, but requires more warmth. See our soil section for more. 12-C and 13-C can be used as temperature tracers that explain ocean circulation. Plants find it easier to use the lighter isotopes (12-C) when they convert sunlight and carbon dioxide into food, thus large blooms of plankton (free-floating organisms) draw large amounts of 12-C into the oceans. If those oceans are stratified layers of warm water near the top, and colder water deeper down) the water cannot circulate, thus when the plankton dies it sinks and carries 12-C with them, making the surface layers relatively rich in 13-C. Where the cold waters well up from the depths (North Atlantic) it carries the 12-C with it. Thus, when the ocean was less stratified than today, there was plenty of 12-C in the skeletons of surface-dwelling species. Other indicators of past climate include the presence of tropical species, coral growth rings, etc. Due to differential uptake in plants as well as marine carbonates of 13-C, it is possible to use these isotopic signature in earth science. In aqueous geochemistry, by analyzing the delta-13-C value of surface and ground waters the source of the water can be identified. there is too much variation from place to place and species to species. There is a slight thermodynamic tendency for heavy isotopes to form bonds with each other, in excess of what would be expected. Thus the occurrence of a CO2 molecule made up of one 13-C atom, one 18-O atom and one normal 16-O atom, adding up to a molecular weight of 47 (13+18+16) is just common enough to be used to detect temperature changes. Lab experiments, quantum mechanical calculations, and natural samples (with known crystallization temperatures) all indicate that delta-47 is correlated to the inverse square of temperature. Thus delta-47 measurements provide an estimation of the temperature at which a carbonate formed. 13-C/18-O paleothermometry does not require prior knowledge of the concentration of 18-O in the water (which the delta18-O method does). This allows the 13C-18O paleothermometer to be applied to some samples, including freshwater carbonates and very old rocks, with less ambiguity than other isotope-based methods. The method is presently limited by the very low concentration of isotopologues of mass 47 or higher in CO2 produced from natural carbonates, and by the scarcity of instruments with appropriate detector arrays and sensitivities. In the previous chapter we've discussed isotopes to measure temperature and, strictly spoken, these are also proxies (L:procurare= to cure, to deal with. proxy= substitute, delegate, representative) even though they are methods rather than substitutes. Here we'll look at various other ways scientists have tried to measure past temperatures. This graph from Globalwarming Art (after Huang & Pollack, 1998) shows a borehole temperature reconstruction (showing 1ºC warming), aligned with the trace from the instrumental record from Brohan et al. 2006, (which shows the most warming of all instrumental records, watch out!). The graph goes back some 500 years, but the further back in time (depth), the bigger the error rate and the flatter the curve, as also details disappear. The basis for borehole temperature measurements stems from the fact that rock is a very poor temperature conductor, but eventually, over time, a small temperature change will happen deeper down. With difficulty, such small changes can be measured, and past temperatures reconstructed. Note that there exists an 'expected' geothermal gradient, the geothermal warming with depth (25-30ºC per km), which must be accounted for. Note also how the red line looks like a hockey stick and does not show recent temperature variations, which is suspect. Neither does it show the Little Ice Age. 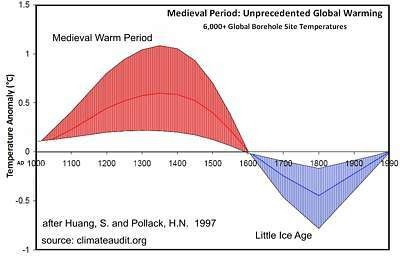 The year before (1997) the same authors (Huang & Pollack) produced a radically different graph, from the same 6000 boreholes and this one showed the Little Ice Age and the Medieval Warm Period earlier on. The 1998 publication selected 358 boreholes out of the qualifying set of 6000. What made the authors change their minds? The hockey stick was published in 1998. Co-incidence? Peer pressure? Fraud? + direct measurement of temperature; no proxies. The graph shows how difficult it is to make sense of borehole temperature data. In fact, it makes little sense. Researchers try to work backwards from the borehole data, using computer models, to a surface temperature record that looks plausible. This is not reliable. Look at the grey cluster of actual measurements to notice that nearly half the samples disagree with the other half. In other words, they disprove what the others are saying. In real science one cannot average such disagreements to arrive at a single agreement. It is called nonsense. http://www.co2science.org/subject/b/summaries/boreholes.php a balanced account of various borehole measurements by various scientists. http://www.ncdc.noaa.gov/paleo/borehole/borehole.html University of Michigan global database of boreholes. Some of the ice masses on Earth have remained for hundreds of thousands of years, like on Antarctica and Greenland. An ice core is drilled with a hollow core drill, in 6m sections at a time. The technique is surprisingly difficult and has been improved over time. The ice mass consists of layers accumulated from snow on top. As layer upon layer forms, the lower layers experience pressure and compaction. At some depth the firn (loose ice and snow) becomes compacted enough such that enclosed air becomes isolated. From here on the ice remains surprisingly similar in texture, with year bands, until a zone is reached where the ice 'flows' as described in part2/glaciers. From here on the age of the ice can no longer be ascertained from year bands. From the enclosed bubbles in the ice, the history of carbon dioxide and trace gases can be followed. At times also deposits from volcanic eruptions can be seen. Ancient temperatures are inferred from oxygen-18 isotopes. CO2 remains controversial because some of it 'disappears' in the first 1000 years, beyond which it produces a credible record. Thus the CO2 values come out too low. drilling is difficult and contamination can easily occur. inexplicable variations between ice cores occur. oxygen-18 temperature records appear truthful, with inexplicable differences between the Arctic and Antarctic. Some trees grow very old, and within their stems they somehow have traces of ancient climates. The width of tree rings represent growth rate, and are thought to agree with temperature because trees grow faster when it is warmer. But such trees depend even more on thaw, cloud level, nutrient availability, sunlight, moisture, CO2, root space, root competition and bacterial activity. A tree surrounded by larger trees, receives less light. During droughts trees won't grow and may die. In other words, the widths of tree rings are poor proxies for ancient temperatures. The oldest known trees are bristlecone pines, eking out a living on the mountain's frost line. So it is thought that these would make perfect 'treemometers'. But what is (again) overlooked that it is scientifically wrong to do measurements on habitat boundaries, because these fluctuate from a variety of causes. Tree rings have been used by the Climate Research Unit (CRU) team to produce the infamous 'hockey stick' temperature graph. In the process they have been able to do some creative selection to arrive at the result they wanted. tree rings are poor proxies for temperature. But they may be very useful to measure overall living conditions in the past, such as monsoons. there are too many other factors affecting plant growth: nutrients, thaw, sunlight/shade, moisture, CO2, root space and root competition. bacterial activity is important to recycle nutrients. Soil must be thawed and not water-logged. Temperature is very important to bacterial productivity. Bactaria also produce CO2. it is scientifically wrong to do measurements at habitat boundaries. forget about tree rings as a proxy for temperature. McKitrick : ".. our model performs better when using highly autocorrelated noise rather than proxies to ”predict” temperature. The real proxies are less predictive than our ”fake” data." McShane and Wyner : "We find that the proxies do not predict temperature significantly better than random series generated independently of temperature. Furthermore, various model specifications that perform similarly at predicting temperature produce extremely different historical backcasts. Finally, the proxies seem unable to forecast the high levels of and sharp run-up in temperature in the 1990s either in-sample or from contiguous holdout blocks, thus casting doubt on their ability to predict such phenomena if in fact they occurred several hundred years ago." - "Furthermore, it implies that up to half of the already short instrumental record is corrupted by anthropogenic factors, thus undermining paleoclimatology as a statistical enterprise." McKitrick R (2005): What is the ‘Hockey Stick’ Debate About? APEC Study Group, Australia link. McShane B M and Wyner A J (2010): A Statistical Analysis of Multiple Temperature Proxies: Are Reconstructions of Surface Temperatures Over the Last 1000 Years Reliable? Annuals Appl, Phys Sep 2010? link. Calcite or calcium carbonate (CaCO3) is a common building material for sea creatures. Because it has both carbon and oxygen, it can be used for the carbon-14 (time) and oxygen-18 (temperature) proxies. (Photo of a sea cave in Niue. Can you see the person in the middle? )Dripstones or stalagtites (hanging down) and stalagmites (growing upward from below) form where ground water drips from a ceiling. Dissolved in the groundwater are several minerals, among which dissolved limestone. As the water slowly drips down, while pausing at a low point of the stalagtite (the upper part hanging down from the ceiling), some of the water may evaporate, leaving a little bit of limestone behind at a rate of 0.1-3mm per year. Because moisture has an annual cycle, year rings can be seen. At the bottom a stalagmite is formed, and at some time the two meet. Dripstones are surprisingly hard. The stalagmites have a more consistent form because droplets splatter and moisture is spread more evenly. stalagmites (on the bottom) have more reliable shapes and year rings. 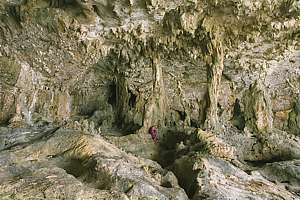 dripstones are easily polluted by people visiting caves. dripstones form faster when air can circulate in and out of the cave. both carbon-14 and oxygen-18 can be measured from dripstones. Foraminifers (L:foramen= a hole; Gk: phero= to bear; hole-bearers) are complex single-celled animals, mostly living on the sea bottom, particularly in the shallow coastal zone. They occur in a great variety of species, often in zones defined by subtle changes in living conditions. All have a hard outer skeleton made of calcite, riddled with holes through which they extend long 'hairy' arms for feeding and for moving slowly. Their numbers keep up with coastal sediment, eventually becoming part of the sediment record. Through tectonic upheaval the sediment can become hard mud stone and eventually re-surface within reach of scientists. But deep sea drilling has also brought this sediment record to the surface. deep sea sediments accrued in a very tranquil environment and do not suffer from surface effects like erosion, waves, tsunamis. their layers are crisp and undisturbed. they contain additional information about species and land-blown dust and pollen. lake sediments also grow in tranquil depths. lake sediments carry additional information about pollen, soot and so on, indicators of historical land use. Corals are animal polyps that live in clear sun-lit waters in symbiosis with plant cells within their skins. They build extensive coral skeletons that join up to make coral reefs. The individual hard corals are joined up by crustose calcareous algae which are technically red sea weeds that also build limestone skeletons. As coral reefs grow, they incorporate a chemical history of the atmosphere, but their mass is too chaotic. 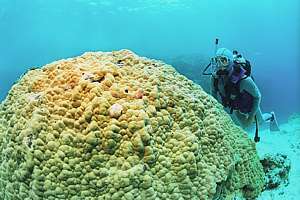 But there are some coral colonies that slowly grow to massive forms of several metres tall and wide, like Porites corals. These are called 'massive' corals even though their polyps remain small. Their mass is neatly ordered in growth layers like those of a tree, and can be used for analysis. One coral analysis has been dissected on this web site and is worth studying (Declining coral calcification ..). corals grow faster in higher temperatures. coral growth is affected by pollution from run-off and eutrophication, which are devastating coral reefs. corals live in the light zone, close to the damaging force of storms. massive corals like Porites show ordered growth rings. old corals (100-400 years) still living today, are rare and are becoming rarer. maximum age about 400 years. The world has experienced a wide variability in temperature. Particularly the most recent period of ice ages shows great instability. For a good overview visit http://www.climate4you.com/GlobalTemperatures.htm. But here we will show the most important facts. First what we know from measured fact. The measurement of delta-O18 from ice cores gives a good idea of general temperatures over a large area because it is proportional to the amount of ice. Note that the present is on left. For over 5 million years Earth's temperature became colder and temperature swings larger. We are now living in the warm phase of an inter-glacial in a long period of 2.5 million years of cold. The most recent 450,000 years have experienced 4 ice ages with 5 warm interglacials. Note that the present is now on right. Note also that our current warm period is not as warm as previous ones, but not by far. Note also that we may have arrived at the end of our inter-glacial, with possibly the next ice age approaching soon (within a couple of thousand years). The past 10,000 years show that our present warm period pales compared to previous warm periods, the most recent of which are the Minoan, Roman and Medieval warm periods, during which civilisations bloomed. 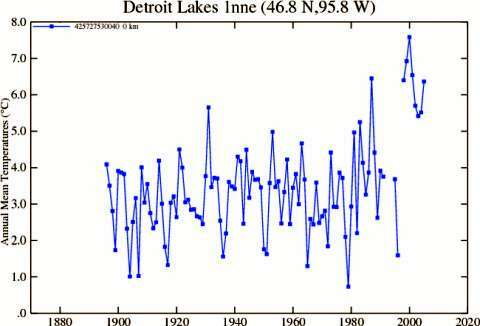 A most interesting analysis was done by J Storrs Hall (link) who compared how temperatures rose after significant cold periods. The dark blue curves are the most recent, following an average shown in black. By comparison our present warm period is shown in red dots, following very much what we could have expected from the past. All curves begin at their lowest points. Earth's temperature has experienced large swings, particularly in the past 2 million years. present temperatures are rather low compared to past episodes. the recent rise in temperature is not abnormal in any way and follows what can be expected. a period of cooling can be expected now. Average global temperature has little meaning without viewing it in perspective, which is what Australian wine maker Erland Happ did from publicly available NCEP data . As a wine maker he noticed that Australia has been cooling rather than warming, and he set out on a quest to understand what the story is. He divided the world into three zones, the arctic where hardly anyone lives (blue zone), the northern hemisphere where most of the world lives (green zone), and the southern hemisphere down to where no more people are found (red zone). His results are shown in the three panels below. the yearly swings in temperature are vastly larger than the trends, prompting one to wonder what the global warming fuss is all about. the minima and maxima have different trends. Which is more important? Food growers and wine makers depend on the maxima, the temperature in the growing season of summer. Because average temperature is calculated as the mean between max and min, it is of little relevance to agricultural productivity. However, corals may be more concerned about maxima connected to bleaching. the arctic (top panel) has a steadily rising minimum but a declining (1960-1980), then rising (1980-2010) maximum, but whatever it does, is of no relevance to living populations. It is also a small area where evaporation plays no role. It is a heat sink. in the northern hemisphere where people live (middle panel), there is a decline (1950-1975), a rise (1975-2000) and a levelling off (2000-2010) in both minima and maxima. in the southern hemisphere where people live (bottom panel), there is first a steep rise (1950-1975), followed by a slow decline (1975-2010) in both maxima and minima, with a significant dip around 1995 and a significant decadal variation. knowing that 25ºC is optimal for plant growth, we see that the temperatures are much too low in all latitudes, and a global warming of a few degrees would be most advantageous to nature and humanity. There is obviously more to global warming than a simple greenhouse effect. See also the influence of wind in Chapter7. Erland Happ (2011): The character of climate change, part 2. http://wattsupwiththat.com/2011/08/16/the-character-of-climate-change-part-2. Part 1. Must read. In the chapters on Urban Heat Island and thermometer locations above, we've seen that the instrumental temperature dataset is rather primitive and not representative of global temperature. But at least those from rural stations could have shown credible temperature trends. Unfortunately the institutions charged with collecting temperature data, have been making adjustments, in order to show global warming. In this chapter we'll examine how they've done that and to what extent. NOAA/NASA: NCDC, The United States National Climatic Data Center (NCDC) in Asheville, North Carolina is the world's largest active archive of weather data. The Center has more than 150 years of data on hand with 224 gigabytes of new information added each day. NCDC archives 99 percent of all NOAA data, including over 320 million paper records; 2.5 million microfiche records; over 1.2 petabytes of digital data residing in a mass storage environment. NCDC has satellite weather images back to 1960. NCDC also maintains World Data Center for Meteorology. The four World Centers (US, Russia, Japan and China) have created a free and open atmosphere in which data and dialogue are exchanged. NCDC maintains the US Climate Reference Network datasets amongst a vast number of other climate monitoring products. CRU: The Climatic Research Unit (CRU) is a component of the University of East Anglia/UK and is one of the leading institutions concerned with the study of natural and anthropogenic climate change. CRU has contributed to the development of a number of the data sets widely used in climate research, including one of the global temperature records used to monitor the state of the climate system. One of the CRU's most significant products is the global near-surface temperature record compiled in conjunction with the Hadley Centre for Climate Prediction and Research. 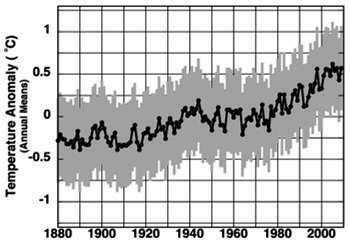 First compiled in the early 1980s, the record documents global temperature fluctuations since the 1850s. The CRU compiles the land component of the record and the Hadley Centre provides the marine component. The merged record is used by the Intergovernmental Panel on Climate Change in all its publications. NCAR/UCAR: The National Center for Atmospheric Research is a nongovernmental institute (business) in the United States that conducts collaborative research in atmospheric and Earth system science. The center has multiple facilities, including the I. M. Pei-designed Mesa Laboratory headquarters in Boulder, Colorado. NCAR is managed by the nonprofit University Corporation for Atmospheric Research (UCAR, a climate business) and sponsored by the National Science Foundation (NSF). Studies include meteorology, climate science, atmospheric chemistry, solar-terrestrial interactions, environmental and societal impacts. UCAR also keeps and adjusts all ice core data. WMO: The World Meteorological Organization (WMO) is an intergovernmental organization with a membership of 189 Member States and Territories. It originated from the International Meteorological Organization (IMO), which was founded in 1873. Established in 1950, WMO became the specialised agency of the United Nations for meteorology (weather and climate), operational hydrology and related geophysical sciences. It has its headquarters in Geneva, Switzerland. It is the UN system's authoritative voice on the state and behavior of the Earth's atmosphere, its interaction with the oceans, the climate it produces and the resulting distribution of water resources. hushing up instrument failure: temperatures are measured from space by radiometers, which do drift over time, as also other components fail or age. To keep using the satellite data, arbitrary adjustments are made and/or interpolations between more reliable stations and/or other satellites. Even though scientists are obliged to document and report such failures, they make an exception for 'global warming'. link. drifting satellite measurements: temperature is measured at a distance by a radiometer. Although these instruments have great short-term acuracy, they have the habit of 'drifting' over time, which makes baseline adjustments necessary. 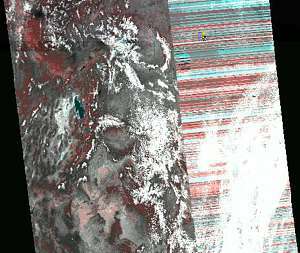 The way this is done, is to bring the satellite data in agreement with (corrupted) ground data. See orbiting thermometers in chapter1. selecting favourable stations: fraud can be committed simply by selecting certain stations over others. promoting urban thermometers: by gradually phasing out rural thermometers in favour of urban thermometers, the Urban Heat Island effect became dominant, giving the impression of steady global warming as world's populations and cities grew. promoting lowland thermometers: the number of sites at higher altitudes (thus colder) diminished in favour of more lowland sites that are warmer. promoting low-latitude thermometers: the number of sites closer to the equator increased and those from higher latitudes (thus colder) decreased. promoting daily maxima: while downplaying minimum temperature measurements, the maximum readings became more prominent where it suited, and minima in other periods. accidental data corruption: where data was corrupted accidentally, it was not corrected when the error gave warming. For more details see the Policy-driven deceptions below. At this point it must be clear that very serious scientific misconduct has been allowed to happen and to continue for at least four decades. We'll now investigate these matters further. Q: Where would you safely store precious ice cores? The graph here shows average temperature over the USA from 1895 to 1996, spanning a whole century. Even though it includes urban thermometers, it shows no appreciable rise in temperature. The 1960-1970s were cooler whereas the 1930-1940s were warmer. 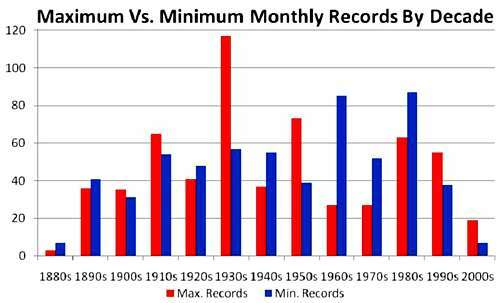 Unanimously, rural records  have shown no significant rise in temperatures. Please note that this is a very important scientific test of the AGW hypothesis, since any exception to the hypothesis (global + warming) disproves it. We may ask ourselves why the scientific method has been abandoned when it comes to global warming. John Daly (2006): What The Stations Say. 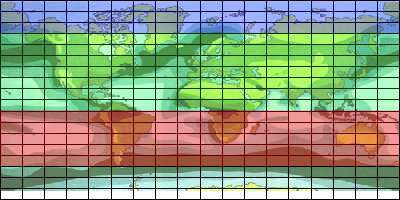 http://www.john-daly.com/stations/stations.htm - check if you can find any that show systematic warming. Excellent world-wide database. Central Europe Temperature Over two centuries of temperature measurements at 5 locations in Europe, track one another remarkably well. They show no remarkable warming or cooling. This graph shows Central England Temperature since 1659. Note that it cannot be said whether warming or cooling has occurred since 1659, even though recent temperatures show some warming. Note also that these temperatures have been 'adjusted' and that present rate of warming is no exception. Note also that this graph does not show recent cooling since 2003, and that climate variability is rather high compared to a possible trend. Visit http://news.thatsit.net.au/Science/Climate/Global-Temperatures.aspx for more thermometer sites around the world, showing basically no significant warming either. A hypothesis is pronounced (global warming occurs due to rising CO2 levels). The consequence (prediction) is that temperatures go up (not down) as more CO2 stays in the atmosphere. In fact, by about +2ºC for 100ppm additional CO2 (IPCC). CO2 is spread quite evenly through the atmosphere and from north to south. So all places should experience some or similar warming. In the past century we've seen CO2 increase by about 100ppm, thus the world must have warmed by +2ºC (not cooled). Indeed the IPCC temperature record comes close to this, due to the UHI, and fraudulent adjustments (see below). But all rural records disagree: there is no warming, and many show even slight cooling. A temperature station does not just produce data; each is an independent 'experiment', testing the hypothesis, and their results must be seen in this light. Hundreds if not thousands of these 'experiments' falsified (proved wrong) the hypothesis. Indeed NONE of the projections (predictions) made by the IPCC have happened - enough to disprove the hypothesis on the basis of its own predictions. Thus CO2 does NOT produce warming. The hypothesis is false. End of scientific debate. The scientific method protects against nonsense. Reader, the importance of the above cannot be overstated, yet somehow the scientific fraternity (brotherhood) did not adhere to its own scientifiic principles in the case of Catastrophic Anthropogenic Global Warming (CAGW) - an unforgivable misbehaviour. We'll now investigate how climate fraud was commited. Where 'global warming' is involved, it has become common practice not to report instrument failures, particularly where such faults produce lower temperature readings. The satellite that first ignited the fury is NOAA-16. But as we have since learned there are now five key satellites that have become either degraded or seriously compromised, resulting in ridiculous temperature readings. Even though the Indian government was long ago onto these faults, researcher Devendra Singh tried and failed to draw attention to the increasing problems with the satellite as early as 2004 but his paper remained largely ignored outside of his native homeland. For at least five years and perhaps longer, NOAA National Climatic Data Centre (NCDC) has been hushing up the faults in their satellites , which is a cardinal sin for any scientist or scientific institute. The picture shows how the path scanned, failed to reproduce the landscape below, resulting in an erroneous stripy pattern, now known as 'barcode'. The data was automatically fed into climate records. This scandal places the entire satellite record in doubt , and the use the IPCC made of it. 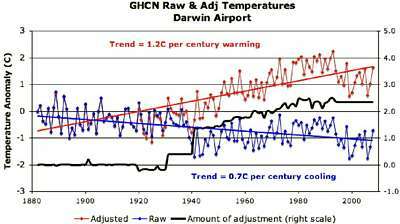 The graph shows temperatures and their adjustments in Darwin (a smallish town in NW Australia). 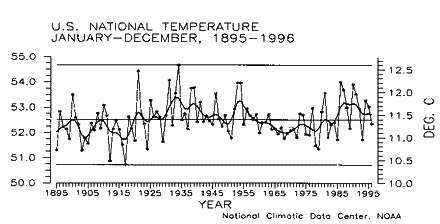 The blue curve is actual temperature which suffered a drop in 1940, thought to be 'unusual', but happening again around 1987. The average trend of the raw data (blue) shows 0.7 degrees cooling per century. 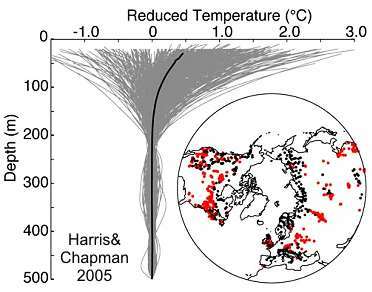 After undocumented adjustments (black curve), the red curve was arrived at, showing warming of 1.2 degrees per century. This is a very blatant case of cooking the temperature, and many such cases have been documented from all over the world. For more information, visit http://climateaudit.org/. Steven Goddard discovered that all US temperatures have been gradually adjusted upward by a whopping 0.5ºF without appropriate documentation. The reasoning behind this adjustment was entirely arbitrary: "many sites were relocated from city locations to airports and from roof tops to grassy areas. This often resulted in cooler readings than were observed at the previous sites." The graph shows the difference between what the thermometers read (RAW data), and the temperatures corrected by the USHCN. One would have expected that adjustments canceled one another out as thermometers are relocated. Could one call this fraud? The graph shown here of unadjusted (green) and adjusted (red) temperatures shows the degree of fraud involved.One cannot believe that there are other scientists willing to defend this fraud. 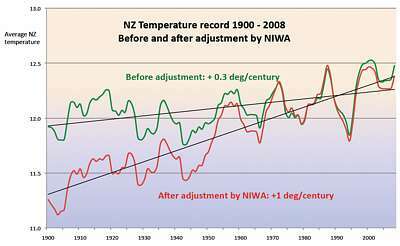 UPDATE 8 Oct 2010: the High Court has decided that the 'adjusted' temperature data could not be used as an official record, and NIWA has also distantiated itself: NIWA now denies there was any such thing as an “official” NZ Temperature Record, and "NZ authorities, formally stated that, in their opinion, they are not required to use the best available information nor to apply the best scientific practices and techniques available at any given time. They don’t think that forms any part of their statutory obligation to pursue 'excellence'.” - what a mess, what a defeat for 'science'. link. Please note that NZ temperatures have a large influence on the 'world average' because there exist very few thermometers in the Southern Ocean. The NZ temperatures are then 'extrapolated' over a very large area. But NZ is not alone as their Australian colleagues are doing the same. 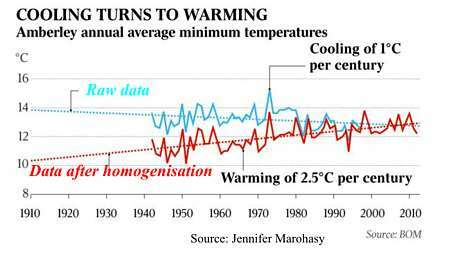 The BOM was caught red-handed in "homogenising" Australia's temperature data, always resulting in cooling the past while warming the present (red graph). 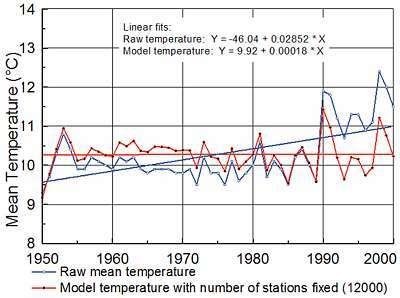 But Australian biologistJennifer Marohasy collected actual temperatures which reveal a different story (blue graph). The people who guard the world's temperature archive (NASA/NCDC, James Hansen in the picture) have been making undocumented adjustments to both recent data and that of a distant past, as shown in these two graphs of US temperature, the leftmost published in 1999 and the rightmost in 2011 . The magenta and green arrows allow comparison between the two graphs. As one can see, past data has been adjusted downward while recent data was adjusted upward, giving the impression of steady global warming. No honest scientist would do this without a written and published record of the changes and the reasons for doing so, while also retaining and making freely available the original unadjusted data. Note that many of these changes were done by computer programs, where they are hidden in computer code. Oops! This graph shows annual mean temperature (magenta) and the number of thermometers taking part (dark blue). Thermometers were sparse before the Industrial Revolution (1850) but gradually rose in numbers, mainly in industrialised nations (Northern Hemisphere). After 1980 most were deselected in favour of automated thermometers. Note how temperatures jumped, first when thermometer numbers jumped up, and again when they dropped down. Here is a detailed view of average temperature and thermometer numbers after 1950. Note how average temperature suddenly began to look like a hockey stick. How did they do this? Mainly by promoting thermometers from warm places and demoting those from cold places ( higher altitudes and remote rural places). 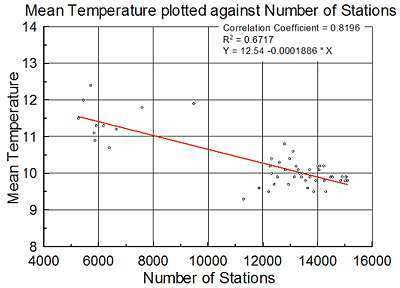 Urbanisation by selection The drop-off in the number of temperature stations has been rather selective, as shown by the leftmost graph where reliable rural stations (green) diminished disproportionally from a high of 8500 to a low of 3000. Note that this may have been due to the fact that rural stations have manning and communication problems. Most stations were lost in the former Soviet Union, China, Africa and South America.The right-hand graph shows how all categories made a mysterious massive jump in 1990, like the year-2000 programming bug described below. This 'adjustment' has not been documented. 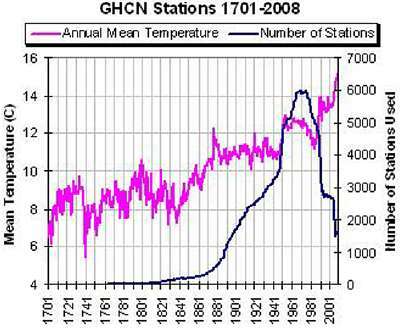 Jonathan Drake  analysed this effect further, in the left graph showing the effect of the number of stations on temperature. When the 'raw' data (blue) is corrected for this anomaly, it no longer shows any warming (red). Reader please note that this huge mistake cannot have happened accidentally, for real scientists would have checked the effects of their adjustments, and then also 'back-casted' the temperatures for the lesser number of stations, as far back as is possible (to the year 1800?). 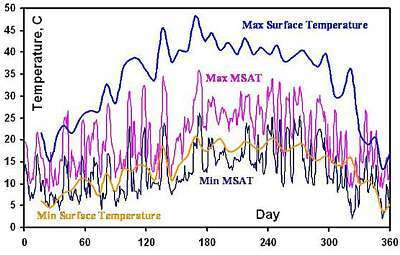 Ross McKitrick (2007): The Graph of Temperature vs. Number of Stations. http://www.uoguelph.ca/~rmckitri/research/nvst.html. Drake, Jonathan J (2010): THE INFLUENCE OF STATION NUMBERS ON TEMPERATURE MEASUREMENT. ENERGY & ENVIRONMENT, VOL 21 No. 8 2010.http://homepage.ntlworld.com/jdrake/Questioning_Climate/userfiles/E&E_05-Drake.pdf. Important reading. This diagram from  above shows how over time, more warmer stations were selected. Horizontal is time, over one century, and vertical average latitude, the distance to the equator. The curve represents the average latitude of the temperature stations used for calculating the world's temperature. One century ago, their average latitude was 35 degrees, but gradually over time, it changed to 20 degrees, with some inexplicable swings inbetween, as more southern stations were included and northern stations dropped off. Thus by design or by accident, more and more warmer thermometer stations were used and/or less and less those from colder places. The result gives substantial over-all warming. This graph shows that the minimum and maximum temperature readings went out of lock-step. Before 1920 their numbers were roughly equal, the maxes sometimes outnumbering the mins. But since 1930 things went wrong, and the minimum temperatures outnumbering the maximums, and since 1980 the maxes are in the majority again, and since 2000 vastly outnumbering the mins, at a time that the globe has been cooling. As a result the past was artificially cooled as the present was artificially warmed. Thus the average temperature has been doctored to fit the AGW hypothesis. In the year 2000, a most curious and massive jump occurred in the temperature data held by NASA, affecting 48 states in the USA. It was not detected by the data keepers but by an attentive outsider, Steve McIntyre. 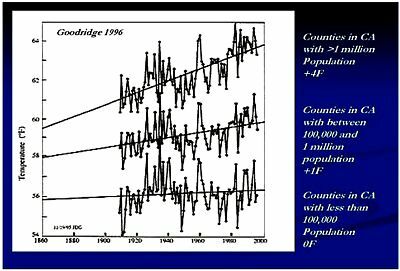 The IPCC was over the moon with this sudden demonstration of catastrophic warming, but when it was exposed as a year-2000 bug in the programs, the correction was quietly made and hushed up. No longer was 1998 the warmest year on record, as was trumpeted around the world. The important lesson is that outsiders are needed to keep a watchful eye on all intended and unintended data corruptions. Important to note is also that keeping temperature data is not just a question of storing, but that there are massive computer programs at work massaging and adjusting this data, which then becomes 'available' to the public as 'raw' data. What these programs do, has not been documented and made public. It may take decades before the mess has been sorted out - if it ever will. http://climateaudit.org/2010/01/23/nasa-hide-this-after-jim-checks-it/ - you could not have imagined this. Essential reading. Instrumental temperature data for the pre-satellite era (1850-1980) have been so widely, systematically, and unidirectionally tampered with that it cannot be credibly asserted there has been any significant “global warming” in the 20th century. All of the problems have skewed the data so as to greatly overstate observed warming both regionally and globally. Global terrestrial temperature data are gravely compromised because more than three-quarters of the 6,000 stations that once existed are no longer reporting. Contamination by urbanization, changes in land use, improper siting, and inadequately-calibrated instrument upgrades further overstates warming. Numerous peer-reviewed papers in recent years have shown the overstatement of observed longer term warming is 30-50% from heat-island contamination alone. Satellite temperature monitoring has provided an alternative to terrestrial stations in compiling the global lower-troposphere temperature record. Their findings are increasingly diverging from the station-based constructions in a manner consistent with evidence of a warm bias in the surface temperature record. NOAA and NASA, along with CRU, were the driving forces behind the systematic hyping of 20th-century “global warming”. Changes have been made to alter the historical record to mask cyclical changes that could be readily explained by natural factors like multidecadal ocean and solar changes. Global terrestrial data bases are seriously flawed and can no longer be trusted to assess climate trends or VALIDATE model forecasts. the instrumental temperature record is in a terrible mess, and the raw (original) data has often been lost. corrections and adjustments have not been documented. to 'correct' for UHI, temperatures were raised rather than lowered. many other corrections have been applied, all promoting recent warming and past cooling. the data record cannot with certainty tell whether there has been any warming or cooling. massive, deliberate (intentional), scientific fraud has occurred. See also hall of shame. see e.g. 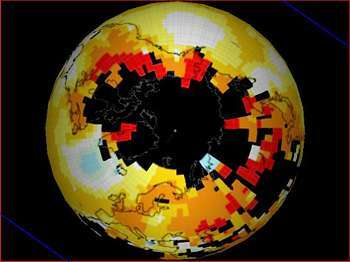 :GISS Caught Red-Handed Manipulating Data To Produce Arctic Climate History Revision link. a major reorganisation must occur and offenders prosecuted.